“Travel and tourism industry is one of the largest industries in the United States, making a total contribution of 1.5 trillion U.S. dollars to GDP in 2015. The industry is forecast to contribute more than 2.6 trillion U.S. dollars to GDP by 2027 […] providing around 5.5 million jobs annually” as reported in the 2016 report by Statista, Travel and Tourism Industry in the U.S. Clearly, tourism should be viewed as a very important industry that has untapped potential for many destination markets. Understanding the tourism market and then being able to capitalize on the many opportunities presented by this developing sector, requires specific strategic planning by communities and businesses alike. Marketing initiatives need to vary depending on the targeted type of tourism. 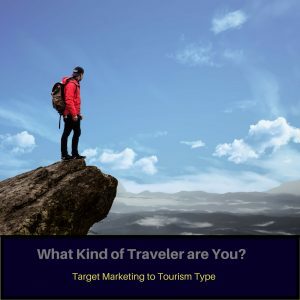 Community leaders, marketers, planners, and business owners need to specifically identify the type(s) of tourism they have an opportunity to capture. Clear objectives and a unified branding focus needs to follow. Yet, regardless of the specific tourism focus, there is a strong commonality forming between each form of tourism. There is a shift to having a focus on the “experiential” qualities of travel associated with each form of tourism. This should be incorporated into that branding focus. What does that mean? 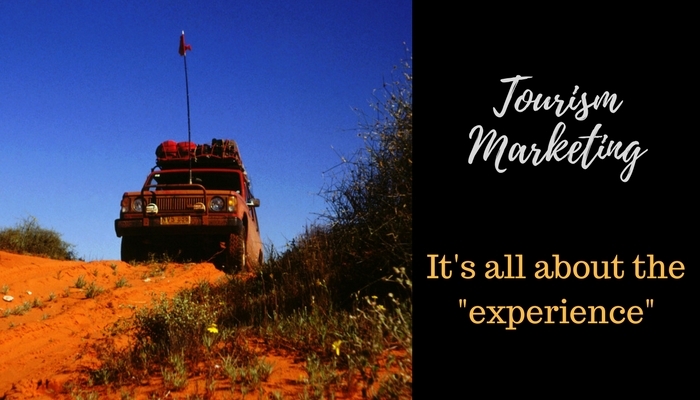 This means that marketing, as well as what actually happens when a tourist arrives at a destination, needs to be focused on the quality of the experience—the immersion opportunity. Consumers want to “experience” a destination, not just “see” the place, but to “feel, taste, and become emerged” in the place, creating a personal connection with the location, its people, the lands. There are many different classifications of tourism, upwards of two or more dozen forms of tourism, but all based on some type of “experience” quality or component. Some of these categories include: adventure tourism, outdoor recreation (sometimes considered to be natural resource) tourism, culinary tourism, dark tourism, ecotourism, cultural tourism, and wellness tourism, to name a few. Adventure tourism: This type of tourism is focused on the adventure presented by the travel such as rock climbing, kayaking/white water rafting, bungee jumping, scuba diving, extreme sports, and others. This type of tourism is focused on creating a “rush” for the traveler. Outdoor Recreational Tourism: Some consider this form of tourism to be a form of adventure tourism without a specific focus on “adrenaline rush” associated with the more extreme sport component. Outdoor recreational tourism, sometimes called natural resource tourism, can involve experiences associated with fishing, hunting, boating, golfing, stargazing, skiing, biking, hiking, camping, etc. Culinary tourism: This type of tourism is focused on experiencing the local cuisine. Marketing of tours around a food and/or drink experience is on the rise. Wine tourism is becoming more popular as is specific culinary experience tours. Dark tourism: This form of tourism is based on a desire of some travelers to visit places where tragedies have happened. Locations steeped in history where significant events transpired have a unique interest to a growing segment of travelers. Ecotourism: This form of tourism includes some component of socially responsible travel and traveling to areas that have focus on nature and natural beauty. This includes a focus on preservation or conservation of natural environments. Ecotourism can encompass components of geotourism, wildlife tourism, natural resource tourism, and agritourism. Ecotravelers are extremely interested in not leaving a “footprint” by their traveling pursuits and search for locations where lodging, for example, is built around environmentally friendly practices. Cultural Tourism: This type of tourism is focused on providing the traveler with a connection to a lifestyle of a particular geographic area, to experience the region’s traditions, festivals, cuisine, arts, architecture, and more, in order to gain a fuller understanding and appreciation for the values that make the place and its people unique. Wellness Tourism: This emerging niche tourism market involves consumers’ pursuit of wellness solutions and experiences that enhance one’s mind, body, and soul. Spas or natural emersion into hot springs, for example, are included under the heading of wellness tourism.